Inder Loves Folk Art: Warm day. It stopped raining and the sun came out (at least temporarily), so I have been very busy in the garden, planting greens, parsley, and cilantro. All I can say is: finally. I feel so behind! But here are two cute blouses I recently sewed up for a couple of little girls in my life, my niece Helen and my friend Anne's little girl, Maeve. This was my rainy weekend project last weekend. 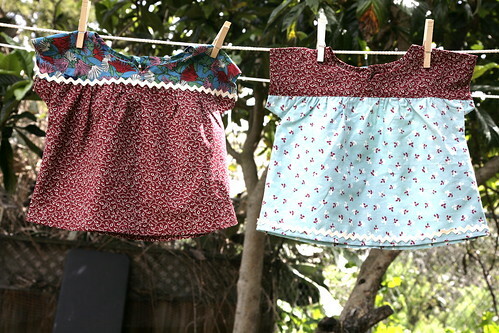 I made these using the Oliver + s pattern, "Ice Cream Dress." Everything you've heard about Oliver + s patterns, it's all true. They sew up like a dream. And I love the classic styles. Their patterns remind me of the clothes you see in old children's books. Both of these blouses used some reclaimed fabric, and some fabric from the stash. 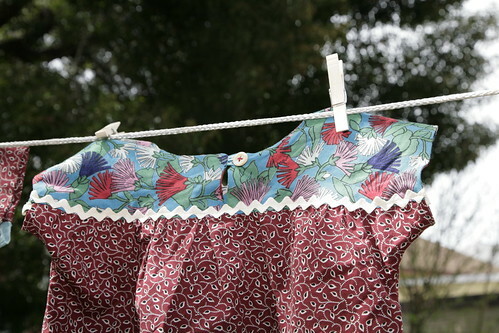 For Helen's blouse, I used an old stained apron from the 1950s I found at a thrift store. I had to cut around some pretty ugly stains, but I love that pretty print! It has a lovely old flour-sack look. Maeve's top uses a pretty deep teal voile print that was once a women's blouse (it never fit me, sadly). I used the same deep red calico for both dresses. 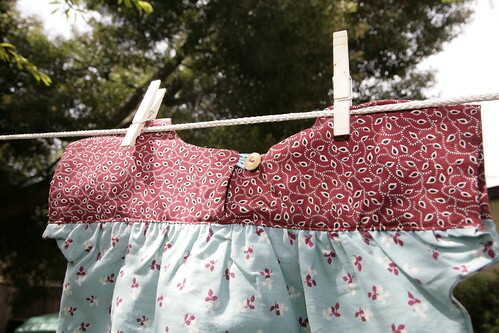 Reusing fabrics from grown women's clothing to make clothes for little girls makes me feel so insufferably virtuous! Look at me! So "make-do-and-mend"! I can hardly stand myself! I'm pretty sure the blouses are both too big for their recipients. I knew I was taking a stab in the dark when I chose size 18-24 months for a ten month old and a seventeen month old, respectively. They'll grow into them at some point. I love the old-timey vibe. And look, our clothesline is back in operation! SUN! This way we get maximum enjoyment out of them.